You know that old saying of abductive reasoning: If it looks like a duck, swims like a duck, and quacks like a duck, then it probably is a duck. Karmakanic, from Sweden and led by bass player Jonas Reingold (Flower Kings), returns with their fourth album, Dot. And yeah. It sure sounds like melodic progressive rock. It's definitely prog. Some simple things to say about this album. As in the past, besides the Karmakanic central collective, the band enlists the help of various artists for vocals and instruments, like saxophone, flute and Andy Tillison on Hammond organ. Also, not unlike previous efforts, Dot has a theme. It revolves around Carl Sagan's comment observing a picture of the earth that Voyager 1 took 1990 from the outer areas of our solar system. "Look again at that dot. That's here. That's home. That's us ... on a mote of dust suspended in a sunbeam." Now we all know that Sagan was an exceptional astronomer and a very smart guy, but to reduce man's existence to the insignificance of a mote of dust pretty much makes him a total atheistic and secular tool. Yet, the concept becomes the centerpiece of the album with the 29 minute song God, The Universe, and Everything Else No One Really Cares About Pt. I (more than a small nod to Douglas Adams) and, at the end, Part II, the latter being instrumental. 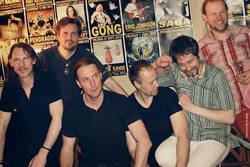 Suffice to say the former is a tour-de-force of melodic progressive rock. Much of it is led by Reingold's bass line, but I also found his delicate and lilting piano quite satisfying. Also midway or so, there's a touch of flute. In the second half, some exceptional choral vocal arrangements. Good progressive rock, by definition, especially the epic longer songs, should offer creativity, variety and intrigue and so deliver interest and entertainment. Everything Else No One Really Cares About Pt. I does exactly that. Additionally, there are three shorter songs. The autobiographical Higher Ground dials back on the diverse complexity, moving on some fine guitar work and more of those lush vocal arrangements. Steer By The Stars pretty much rocks, applying AOR pleasantry to some mild prog intrigue. The melody in the refrain's vocal harmony is quite tasty and my remind some of Yes. Traveling Minds, again, has more lush vocals but, through largely two-thirds of the song, is driven by a fluid electric guitar line, before giving way to piano and Hammond at the end. Bottom line? 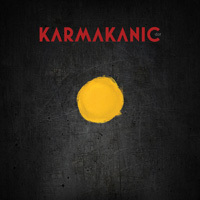 Excepting the weird title track intro and the questionable concept, Karmakanic's Dot is another exceptional album of melodic progressive rock from this talented band, one that should please even the most critical prog rock geek. Easily recommended. Karmakanic's Dot is another exceptional album of melodic progressive rock from this talented band, one that should please even the most critical prog rock geek. Easily recommended.